Like all other models of the AX-Series it features the proprietary X-ART tweeter. The very data of this technology shows that it is at the forefront of what tweeters can accomplish. Numerous listening tests have confirmed this. A 5.5” Midwoofer reproduces the frequencies below 2.5kHz. The diaphragm is made from Carbon fiber/Rohacell/Glass fiber, which is the same composite structure shared in the next two bigger models. This material with minimum weight and maximum rigidity prevents break up resonances, resulting in an outstanding dynamic behaviour and impeccable sound characteristics. The ADAM A5X’s centrepiece is its eponymous X-ART tweeter, a tweeter that is empirically placed as an industry leader thanks to repeated listening tests. The 5.5” midwoofer’s diaphragm is built with exceptional materials (Carbon fibre, Rohacell and Glass fibre) to avoid breakup resonances, while reproducing frequencies below 2.5kHz, thanks to its exceptional rigidity and lightness. This affords superb sound characteristics and unbeatable dynamic behaviour. 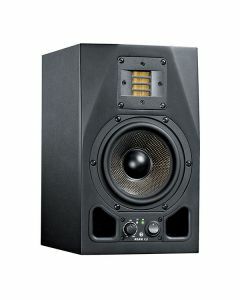 Individual to the ADAM A5X monitor is the indispensably useful Stereolink – a pair of supplementary RCA connections allowing you to bypass the second stereo channel to the other speaker. This intuitive feature allows the user to control the system’s overall stereo volume from either speaker’s gain control, making the ADAM AX5 an obvious choice for “mixerless” desktop applications where easy adjustment of the overall system volume is key.